Who doesn’t like peanut butter cups? Well I made them into muffin form! I slightly tweaked my recipe for double chocolate donuts for these Peanut Butter Cup Muffins. These came out super good! This would make a yummy breakfast for on the go. There is also a good amount of protein in each muffin. I made jumbo muffins for the photo, but you can also use standard muffins. These muffins are vegan and gluten free. Great for on the go! I hope you enjoy them as much as we did. 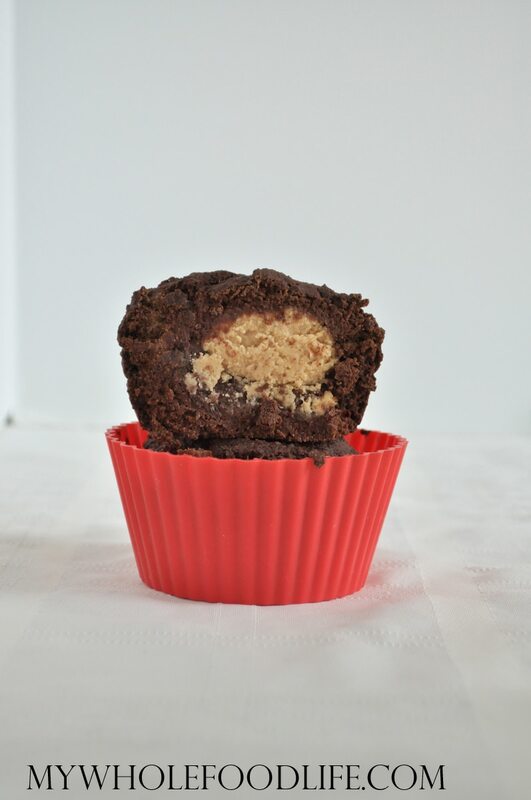 A peanut butter cup in muffin form! Vegan and gluten free! Add wet to dry and mix until combined. If the batter looks a little dry, you can add more milk. Line muffin pans with liners. I use silicone liners and do not need to oil them. If you use paper liners, they will need to be greased to prevent sticking. Put a little batter into the bottom of each muffin cup. Using a small cookie scoop , scoop a little peanut butter onto the top the batter in each cup. Fill the remainder of each cup with more batter until all the muffin cups are filled. Keep these stored in the fridge or freezer. They should last a couple weeks in the fridge and 6 months in the freezer. Enjoy! Just wondering, Melissa.. do you have any calorie, carb or fat gram #'s ? Thanks!! These look Amazing!!! I just want to clarify, the peanut doesn't get mixed with the wet ingredients, it's just for the filling? I think you could. My guess would be the same amount. The timing of this recipe was perfect! I got your e-mail the same morning that I was going to make muffins for our next day outing. Since we all LOVE peanut butter combined with chocolate, it was a no brainer. Yum! These muffins were wonderful! Thank you so much for sharing this recipe. It is a keeper! I'm wondering what kind of peanut butter you used, because it looks as though you added something to it. It's thick and It doesn't look like jiff or skippy and not real peanut butter because it's runnier. I used fresh ground peanut butter from Natural Grocers. It always looks like that. Wow.... it's like you've taken the best dessert ever and transformed it into something that isn't quite as bad for you!!! And I mean..... it's got peanut butter in..... it's like the best thing ever!!! You can probably use yogurt or banana. R all/or some of the recipes that follow GF? Can Almond Flour be used? So to make them Paleo. I'll also use Almond Butter. If you try, I would suggest adding one more egg. Would I be able to substitute pure, unsweetened, brick chocolate for the cocoa powder? (My husband brought home 5 pounds from Cusco, Peru, and I don't know how to use it. He was told it has to be "cooked" first.) Thanks for any advice.